I’ve been an Associate Member of ODOC for a couple years now and I lurked in the background for a few years before that. I’ve known I wanted a DeLorean since I was about 13. 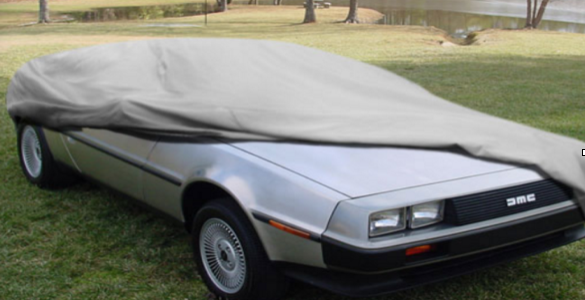 Like a lot of DeLorean owners, I was first exposed to the car watching Back to the Future. When the car rolled out of the trailer in that first scene, and Doc Brown stepped out from underneath that gull-wing door, I told my mom “I’m going to drive one of those one day.” For me, that day was last week. Fast forward to about a month later and I’m waiting in a mall parking lot at 9:00 am on a bright Saturday morning. I saw the DeLorean off in the distance. It’s not a very inconspicuous car and is easily picked out of a crowd. With the windows down, the owner said “hop in!” I pulled open the passenger door and slid into the seat. We went out for a cruise around town for the better part of an hour talking about classic cars. After a few kilometres on the road, numerous waves and thumbs up from passing motorists, we ended up back at the mall parking lot. I was given a quick lesson on how the car runs and the keys. I sat down and was told I had to slam the door. I’ve always been gentle with classic cars, so I must have not taken him seriously, because it didn’t close. It’s a rather strange experience trying to slam a door that opens upwards. As with any manual transmission car, brake first, then clutch, then turn the key. The clutch pedal in the DeLorean is the heaviest clutch I’ve ever stepped on. The car rumbled to life and we started to roll. Clutch out, feather the gas. The gas pedal is just as heavy as the clutch. With the engine in the back, and the car using a cable instead of a computer, the cable on the gas pedal has to travel quite the distance to get to the engine. Its one of those things that you never think about until someone points it out. I loved my experience in the driver’s seat. One of my childhood dreams had been fulfilled. Finally, I had driven one of these, and it was everything I expected it to be. The car looked fantastic, it drove like a dream, and everyone on the sidewalk was smiling and waving. After my drive was over, I pulled into an empty section of parking lot and turned the car off. After some photos, and a joke about going 88 miles per hour from a passing pickup truck, it was time to go home. I watched the DeLorean pull onto the road and down the street. I wish there was no snow on the ground. Actually it’s not really all that bad today, but look at the winter road salt that’s spread everywhere. That’s more of a problem, really. I wish there was no salt on the roads. Surely in this day and age they can invent something that helps to melt snow and ice without simultaneously dissolving our cars. I’d love to be able to take the car out for a blast in the countryside. It’s a nice sunny day. But it’s minus 20 degrees and there is too much snow and salt on the ground. Dammit! Maybe I’ll just go out and sit in the car. Yeah, I will. If it is possible to get the workshop door open, I will do so, and let the sunlight in. Then I’ll sit in the driver’s seat and let my imagination go….! Hmmm… Maybe I’ll connect the battery and start her up. OK. I’ll do it. Wow it started perfectly. No trouble at all. Idles nice. Never really noticed how little room there is in the car when you have your big mad winter coat on, your slush pants, your Canadian Tire Winter boots and your hat and gloves. I guess I am usually dressed in shorts and t-shirts and runners when I drive this car under normal summer circumstances. Of course there is also naked Fridays, but let’s not talk about that here!!!! Let me tune in the radio as I sit here with the engine running. Yay! This is the closest thing I can get to actually driving the car at this time of year. Maybe I’ll move the car back a few feet or so. Yay. Ok, now I’ll move it forward again. Alright!!! Is the heater working? Check. Holy smokes it really is hot! Does the horn work? Check. Is the blower motor working at all speeds? Check. Can I slot into each gear as if I was driving? Check. Do the wipers work? Check. Not that this car ever sees rain unless I get caught out in a sudden summer shower. Do the windows buzz up and down? Check. Lights, indicators? Check, check! What else can I do? Not much. Lemmee check the horn again. Yep, still works. I wish I could go for a drive. Ah, did you hear that? The radiator fans just kicked in, right at the correct temperature on the dashboard gauge. They always come on when the gauge points to 8 o’clock. Let me take a peek around the engine. Looks good. No leaks. No strange smells or sounds. Nothing to cause any worries or concerns at all. Great! Back inside the car, everything seems to be working correctly. Did I check the horn? Better be sure. Yep, it still works. Ok, may as well shut her down and disconnect the battery again. It’s such a nice bright day. I really wish I could go for a drive. Well, may as well close the workshop door, lock up the car and say good night until next weekend or the next mild day. Maybe there will be an above-zero day soon and if the roads look clean enough I can take the car out for a blast. Maybe. But probably not!!! – Sheckulous Wilberforce Tiberius Moriale. “Oh yeah? Well I guess. These things had a V8 right? A Ford V8. Should be pretty fast”. “No, it’s got a V6, a PRV V6”. “A what? A Pee-orr what? “No you are mistaken; these cars were built in Northern Ireland”. “No, no, no… they were built in Newfoundland. They are a heap of junk aren’t they? Yeah, built outta aluminum. Heap of junk alright”. “Whaat? OK, the DeLorean was built with a PRV V6 in Northern Ireland from 1981 to 83. It is not a heap of junk. You may be thinking of the Bricklin which was built in New Brunswick not Newfoundland around 1975 or so, and it also is not a heap of junk. Yes both cars have gull wing doors, but the DeLorean is built with stainless steel body panels whereas the Bricklin was made of fibreglass”. “Actually they do not weigh a ton. They are 2700lbs. A Corvette from the same era was 3200lbs and a Mustang was almost 2700 lbs. And if you are interested in power, you might like to know that the DeLorean has more horsepower than the Mustang of the same year”. “Well I dunno… but even the doors were hysterical. How do you get into those cars if you are in a tight spot in a parking lot? I guess they didn’t think of that did they? Ha ha. Another failure for sure”. “Actually all you need is 14 inches of clearance. Because the hinges are closer to the center of the car, they need less room to swing open than a regular car door. You can easily get into this car in a tight spot whereas you would not be able to get into a regular car with regular doors in a similar tight spot”. “He was actually acquitted as the jury felt he was entrapped. By the way, speaking of scandals… Is that YOUR Volkswagen Diesel” ? So… what is it? What is it that makes people go so crazy when they see a DeLorean? I took my car out today for a quiet drive on the morning of the Sunday of a long weekend. I figured I would get some nice quiet roads, some cool country bends and twists and finally maybe end up at some ice cream stand in the middle of nowhere where I could take a pleasant break from the wheel and enjoy a nice ice cream cone in the hot magical August weather.Did I get that quiet time I was looking for? Hell no!I got at least 87 thumbs up from bikers driving towards me and away in the distance of my rear view mirror. At least 47 car drivers honking and giving me the thumbs up sign, and countless pedestrians/hikers stopping to take a second look and pointing as I drove past. Regardless of some of the bikers prompting their passengers to look, and the glazed looks by some pillion passengers, the reaction was as insane as ever. Some rather nubile-looking and very shapely pillion passengers were somehow unaware but yet in awe, while other more mature riders were just as awe-struck upon seeing a DeLorean meandering through the country roads with no concern for anyone or anything.So I said to myself, I said: “self,” I said, “why are soo many people soo blown away by a simple, solitary car?” I couldn’t answer myself which is probably a good thing as I was approaching a set of traffic lights on the outskirts of a tiny town at the time and concentration is key when driving a DeLorean where anyone or everyone will almost attack you while asking about flux capacitors or time space continuums as you politely endeavour to drive through a one-horse town in the middle of nowhere. So many people seem to want to say something to the driver of a DeLorean. But why? I don’t get it. I know all the Back to the Future stuff, I get it. I really do. I love the movies too. Seriously, I do. But my car is not a Back to the Future car. It is an almost stock DeLorean from waay before the movie was released. Anyone who remembers the car from before the movie will probably appreciate my car as a DeLorean and not as a movie star. And there are so many of those people out there too!!! But why such a reaction? Seriously, why? Does any other early 80-s sports car get this much attention? I suggest to you that the answer is no. But why not? What is it that the DeLorean seems to bring out in people? Is it the cool sports car built by a former GM big shot who thumbed his nose at the GM establishment? Is it the fact that it is an unusual car with stainless body panels and gullwing doors? Is it the fact that they were produced for such a short time and are now so rare? Or is it because it was the focus of one of the biggest movies in Hollywood history? I don’t know the reason. I wish I did. It is sometimes a little tiring to have to give the usual smiling response, and the occasional explanation of what the car is, to other drivers at gas stations. But at the end of it all, every time I take my DeLorean out for a drive, I know that I will get some sort of affirmation and confirmation that my little car is either cool, or awesome or just a beautiful machine. I got all three this morning, and I drove home with a smile on my face! And these observations are almost guaranteed whether or not people make comments on the presence or not of a flux capacitor!!!!! Or as a trucker yelled at me last week from his waay high up open window to my little ticket booth passenger window; Hey man, does it have a flux Kapasit-tayter??? What the hell is a Kapasit-tayter?? ?